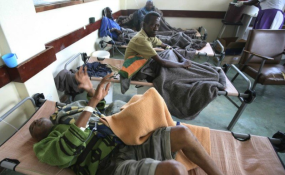 The cholera outbreak currently ravaging Harare has spread to Chitungwiza and Gokwe in the Midlands province with the death toll in the capital alone reaching 16, it has emerged. Health ministry officials and the Harare City Council battled last week to control the outbreak in Harare's Glen View suburb that claimed 11 lives, five more confirmed cases were reported in St Mary's Chitungwiza as well as Glen Norah on Sunday. Council health director Dr Clemence Duri the death toll had since increased to 16. "As of today (yesterday) 106 people were admitted at Beatrice Infectious Diseases Hospital. Some of the patients were being treated and discharged. "We have also decommissioned all boreholes in Tichagarika area (Glen View), after they were exposed to bacteria which causes cholera and typhoid." New cases were also reported in the Midlands province's Gokwe area. Provincial Medical Director Dr Simon Nyadundu said four suspected cases had been attended to. Community Water Alliance (CWA), a non-governmental organisation working with Harare City Council, said 400 cases have been reported with some still to be confirmed by the Health and Child Care Ministry. Efforts to get a comment from the ministry of health were fruitless Sunday night but the government for failing to bring the outbreak under control. Meanwhile, MDC Alliance principal and Transform Zimbabwe President Jacob Ngarivhume in a statement on Sunday criticised the government for its failure to prioritise the health and welfare of citizens. He noted that government was hiring a private jet for US$1.3 million to bring home former first lady Grace Mugabe home from Singapore to attend her mother's funeral while Harare City Council is in dire need of just US$200 000 to fix the water problems. "There is a very thin line between witchcraft and hiring a G650 aircraft for a grieving, rich former first lady while people are dying of primitive diseases like cholera when an equivalent $200 000 can transform the water system of Glen View and Harare to save lives," said Ngarivhume.